David John Bartholomew FBA (born 6 August 1931) is a British statistician who was President of the Royal Statistical Society between 1993 and 1995. He was Professor of Statistics at the London School of Economics between 1973 and 1996. David John Bartholomew was born 6 August 1931, the son of Albert and Joyce Bartholomew. He was educated at Bedford Modern School and University College London where he earned his BSc and PhD. Bartholomew began his career as a scientist at the National Coal Board in 1955. In 1957 he became a Lecturer in Statistics at the University of Keele, before his appointment as a Senior Lecturer at the University College of Wales, Aberystwyth. 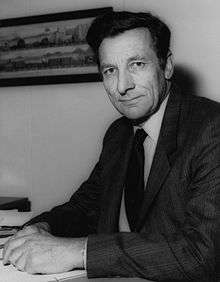 Bartholomew was appointed Professor of Statistics at the University of Kent in 1967 before being made Professor of Statistics at the London School of Economics in 1973, a position he held until 1996. He was Emeritus Professor (Pro-Director) between 1988 and 1991. Bartholomew was President of the Royal Statistical Society, 1993–95 (Hon. Sec., 1976–82; Treas., 1989–93). He was Vice-President of the Manpower Society (1987–95) and was Chairman of the Science and Religion Forum between 1997 and 2000. Bartholomew was elected a Fellow of the British Academy in 1987. In 1955 Bartholomew married Marian Elsie Lake, and they have two daughters. Bartholomew has debated atheist physicist Victor Stenger on whether or not God is a failed hypothesis. 1 2 3 4 5 6 7 8 9 10 11 12 13 14 15 16 17 18 19 20 21 22 23 24 25 "BARTHOLOMEW, David John (born 1931), Professor of Statistics, London School of Economics, 1973–96, then Emeritus (Pro-Director, 1988–91)". oup.com. Retrieved 10 July 2015.